This is life changing. I had added this video at the top of the blog as another permanent one, but it really slowed down the page loads, so I took it off. I cannot emphasize how valuable this 35 minute video is to us all spiritually and I do pray you watch it. I have a fantastic gift for you to help start the new year BRIGHT! Everything in the store, all 70 kits, are 50% off (except the Shimmering Angel Special Combo Pack and Rejoice/Penguin World Special Combo Pack which are already greatly reduced)! Minimum purchase must be at least $1. Perfect for catching up on all your scrapping projects! Just e-mail the list of kit names you want to lynette@lynettesphotoart.com and I'll send you a PayPal invoice. As soon as you pay, I e-mail you the download links! Don't miss this fantastic opportunity and please support the work of this blog with your purchases. Merry Christmas! 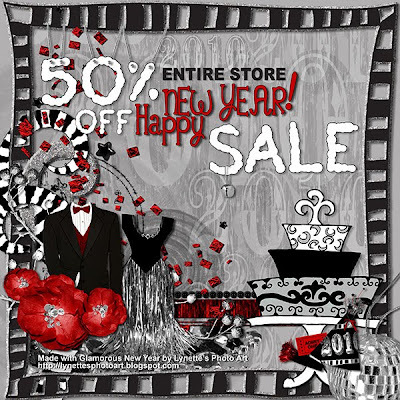 I made this sale graphic using my newest kit, Glamorous New Year. Glamorous New Year is a sparklingly elegant "black tie" kit of 54 pieces for any formal layouts, proms, weddings, anniversaries, and of course, New Years. Unique elements include gowns, tuxes, cake, word arts, party hat, a mask and confetti and star spills...click the preview below for a complete list and Buy It Now Button. Today's gift is another piece from my Glamorous New Year Kit. I'm giving a piece away daily, but if you want the entire kit you will need to purchase it. Another gorgeous piece, thank you! Thank you! Your blog post will be advertised on the DigiFree Digital Scrapbooking Freebie search engine today (look for timestamp: 09 Jan [LA 03:41am, NY 06:41am, UK 11:41am, OZ 10:41pm] ).